Labor and Imperial Democracy in Prewar Japan examines the political role played by working men and women in prewar Tokyo and offers a reinterpretation of the broader dynamics of Japan's prewar political history. Gordon argues that such phenomena as riots, labor disputes, and union organizing can best be understood as part of an early twentieth-century movement for "imperial democracy" shaped by the nineteenth-century drive to promote capitalism and build a modern nation and empire. When the propertied, educated leaders of this movement gained a share of power in the 1920s, they disagreed on how far to go toward incorporating working men and women into an expanded body politic. For their part, workers became ambivalent toward working within the imperial democratic system. In this context, the intense polarization of laborers and owners during the Depression helped ultimately to destroy the legitimacy of imperial democracy. 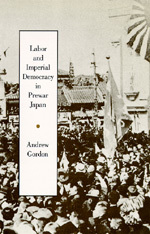 Gordon suggests that the thought and behavior of Japanese workers both reflected and furthered the intense concern with popular participation and national power that has marked Japan's modern history. He points to a post-World War II legacy for imperial democracy in both the organization of the working class movement and the popular willingness to see GNP growth as an index of national glory. Importantly, Gordon shows how historians might reconsider the roles of tenant farmers, students, and female activists, for example, in the rise and transformation of imperial democracy. Andrew Gordon is Associate Professor of History at Duke University and author of The Evolution of Labor Relations in Japan: Heavy Industry, 1853-1955 (1985).